Peter Robinson has rejected the proposal from the North’s Attorney General that there should be no more prosecutions for killings carried out during The Troubles. 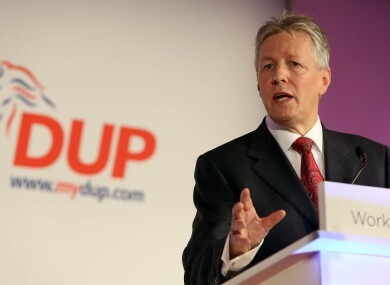 DUP LEADER AND Northern Ireland First Minister Peter Robinson has used his keynote address at the the unionist party’s annual conference to state his clear opposition to any sort of amnesty for those who carried out attacks during The Troubles. It follows controversial comments this week from the North’s Attorney General that there should be no more prosecutions for killings carried out before the 1998 Good Friday Agreement. Addressing the party faithful at the La Mon Hotel in Co Down, Robinson said he didn’t know whether a way forward from the past could be achieved “but surely we can at least agree that people must not be re-traumatised in the future”. “I know from speaking to victims first-hand that events, now decades old, still haunt them on a daily basis,” Robinson said. “For them it’s not about the past — it’s their present and it’s their future. “One cannot fail to be moved by the suffering they have endured. Addressing John Larkin’s proposals earlier this week, Robinson said he didn’t think it was right that “victims should have no hope of a prosecution taking place that would give them some element of justice”. The DUP leader also touched on the Belfast City Hall flag protests in the course of his speech. He said most unionists had been disgusted by the violence that followed the decision to limit the number of days the flag was flown, calling the unrest “morally wrong” and “counter-productive”. Email “"People must not be re-traumatised": DUP leader reiterates rejection of 'amnesty' proposals ”. Feedback on “"People must not be re-traumatised": DUP leader reiterates rejection of 'amnesty' proposals ”.